OpSpec Training has not visited the San Antonio area in more than three years. 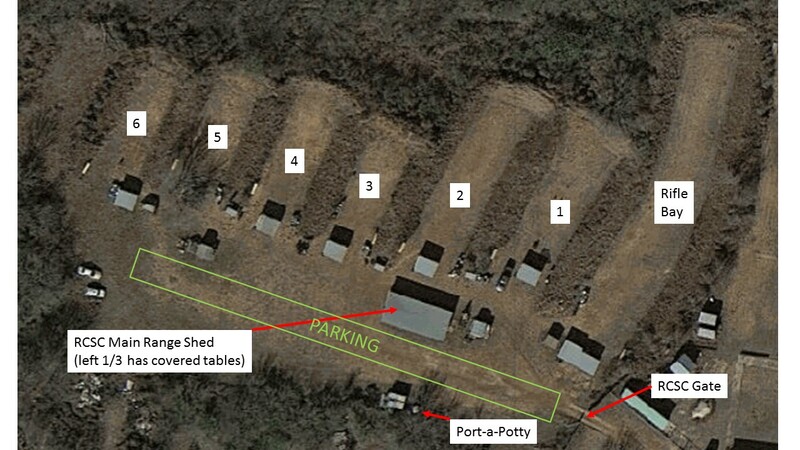 With assistance from our local host, we’ve secured a new location just southwest of San Antonio at Blackhawk Shooting Range. We’ll be holding our very popular Practical Fundamentals class on March 16 & 17. Max Michel has run a couple of classes at Blackhawk, and from what we've heard, he was pleased with the facility. Blackhawk is located less than 45 minutes southwest of San Antonio’s River Walk in the city center, and about 45 minutes (drive time) southwest of San Antonio’s International Airport. This is not a basic class. At minimum, students should have taken a basic handgun safety course and be confident with their firearm and gear. 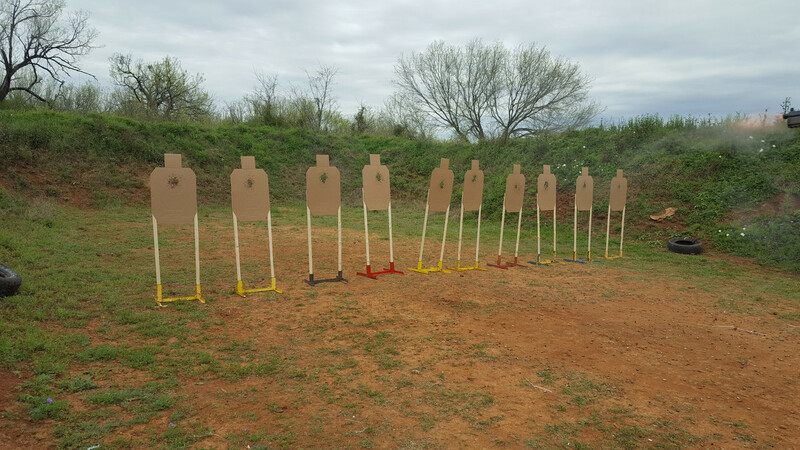 We expect students to have experience shooting on a line in a safe manner, including loading, reloading and drawing/shooting from the holster. 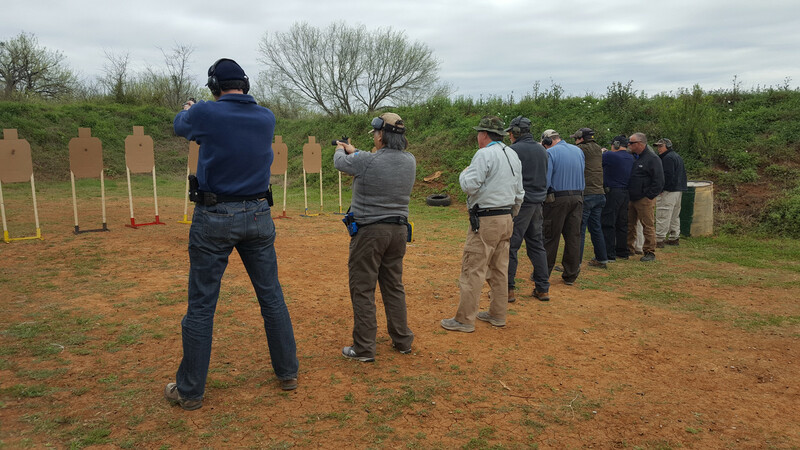 Shooters with IDPA, USPSA, NRA Action Pistol, 3-Gun, law enforcement and military experience meet the program prerequisites. Using a building-block approach, Practical Fundamentals encourages students to focus on the process of running the gun, tamping down the emotional desire to see results on the target. By using a variety of dry fire and live fire exercises, students are brought through the fundamentals of marksmanship with a focus on trigger control to help the shooter make fast hits on small targets, on demand. Class size: Limited to 24 students, with a minimum of 12 students. Range Fees: $25, to be paid in cash directly to the range on the morning of March 16. Local Host: Chris Gourley - Chris has hosted previous OpSpec Training classes in the San Antonio area. * Instructors listed for specific programs have committed to teach the class on those dates. Although we do not anticipate changes, travel delays, family emergencies or illness may result in instructor substitutions. Best Western Plus Lytle Inn & Suites is located about 15 minutes to the southwest on I-35 in Lytle. It has been suggested by the range owner as a good, local option. If you prefer to be closer to San Antonio, their are a variety of options both north and south of Lackland Airforce Base about 25 minutes away. If you’d like to stay at a location more convenient to and from the airport, there are many options along the western I-410 loop that encircles the city. To ensure you get the most “bang for your buck” we keep lunch breaks to one hour. If you have the ability to bring your lunch, we suggest that you do that as food options for lunch are 10 to 20 minutes away. If you need to run out and get a quick meal, there is a Subway located about 15 minutes east of the range. Evil exists. You can not negotiate with, bribe or placate evil. You're not going to be able to have it sit down with Dr. Phil for an anger management session either. Hey, everybody. I'm Chris, the local host. Feel free to ask if you have any questions about the facility or area. Hey Chris, will there be mud? I have a water truck on standby, just in case it doesn't rain. Wouldn't want you to feel out of your element down here. We've actually had a very wet summer. We never went past Stage 2 water restrictions, even with a few months near 100 degrees almost every day. I'm hoping that doesn't foretell another mud class. Do you know I still have brass from the 2012 class that has mud on it. I'm slowly processing through it. If it happens again this time, I'm investing in a wet tumbler (or a used washing machine)!! Great to see this coming to Texas. Please do spread the word! Same weekend as Rangemaster Tactical Conference. Bummer. JAFO and JLJ--Glad this is coming back to the San Antonio area. Great class, highly recommended. I'm still working on perfecting what I learned in 2012! P226-X-Five 9mm, P226-9/40/357SIG/22LR, P239-9, Kahr PM40, Desert Eagle 1911G, CZ75B 9mm, Savage 308 bolt gun, Stag Arms AR-15. Bump for S.A.. If you're on the fence, get registered so they count you towards the number of students. If you have any questions, please just ask. We're working hard to make this class happen and would love to get back to Texas to teach a class! This class is a GO, and there is VERY limited space available. It will be a small class with a lot of personal attention from the instructor. If anyone wants to have their ammo drop-shipped ahead of the class, you can email me. I'll send you my address to ship it to my house and I'll hold it for you until the class (unless we make other arrangements for pickup). Just make sure to send me the shipping details so I know which package belongs to whom. 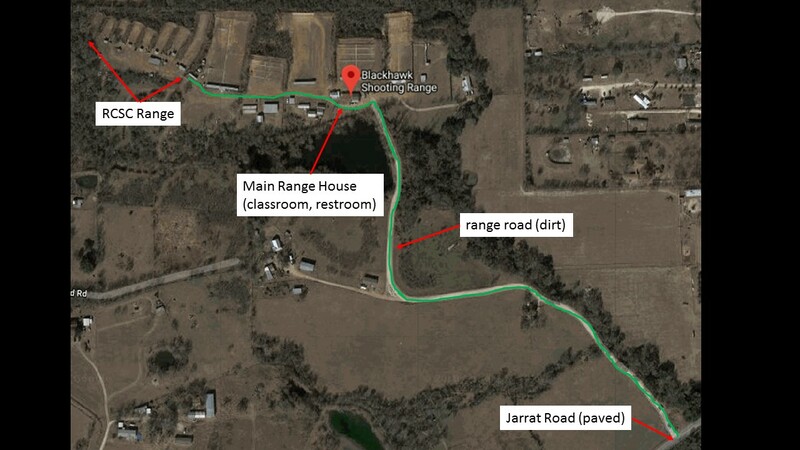 Here are some images showing the road to the range from Jarrat Rd, as well as the layout of the River City Shooter Club (RCSC) portion. Another successful PF class completed. Thanks to OpSpec for moving forward with the class, despite our being slightly below the attendance requirement. I've always said that PF seems to change each time I experience it, and this time the cadence shooting drills were something new to me. I enjoyed them, though. I realized while doing ever-faster multiple shot drills that if my trigger control started getting away from me, I could start counting a cadence (sometimes even out loud ) and it would come back. Giving the conscious mind the job of counting seemed to let the subconscious take over the shooting, which inevitably improved the results. 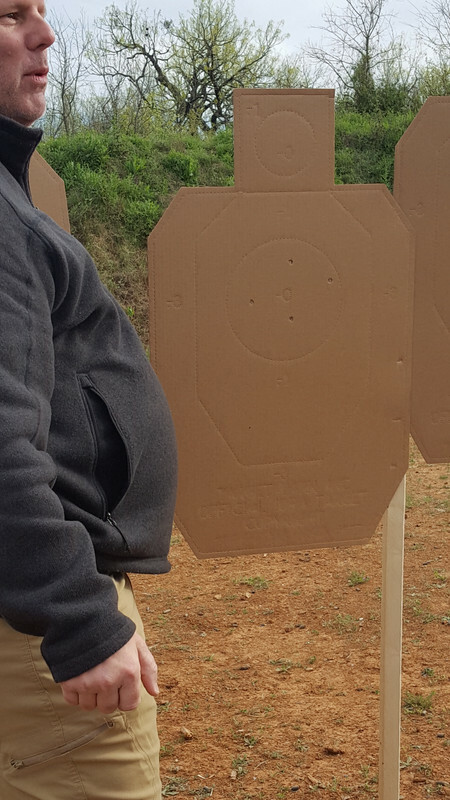 Through the two days of drills, I also found my weakest point - the draw to first shot. No matter how successfully I could increase my cadence on multi-shot strings, I was never comfortable speeding the first shot up, too. I think it's either not being able to bring my focus back from a spot on the target to the sight faster, or perhaps a lack of confidence that the sight will be where I want it to be at full extension. Whatever the reason, I was definitely shown what I need to work on most. 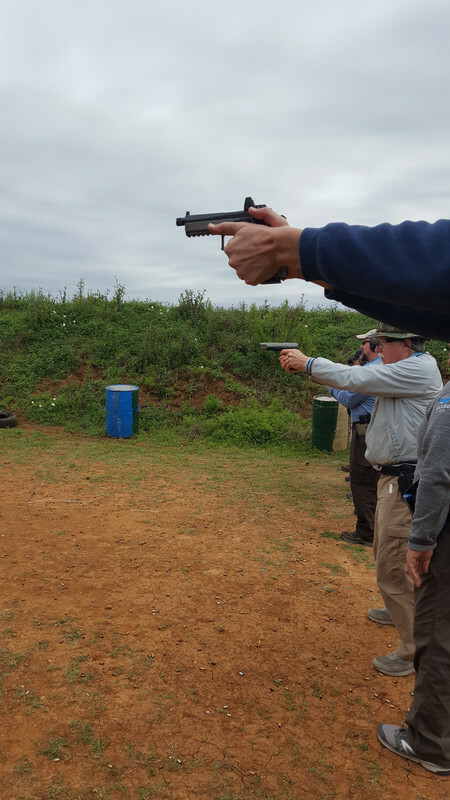 For a small class, we had a big variety of pistols used over the course of the class - XDm, CZP09, G19, Beretta PX4 & 92, HK VP9, and Sig 320, 320X5 & 226X5. Everyone doing their best to blow out that center circle! Jerry explaining that, within a certain distance, your front sight can be anywhere in the window of the rear sight and you will still be on target. Don't stress about perfect sight alignment. And, lest I forget, our unofficial range mascot on Saturday. 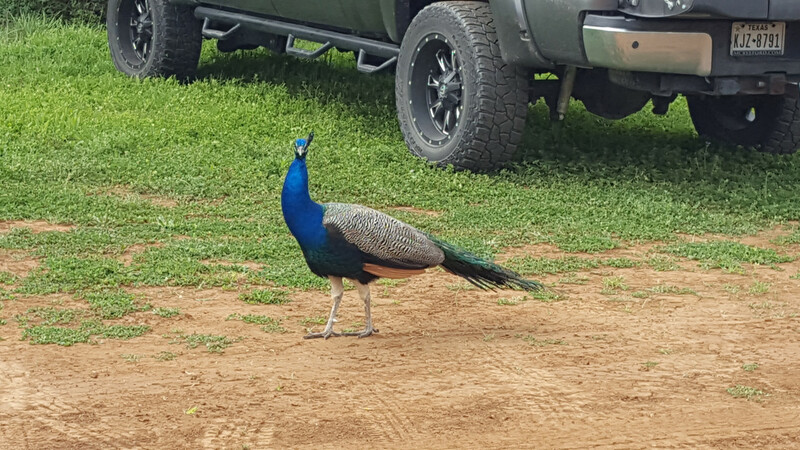 This brilliantly colored peacock just wandered onto the range and hung out with us for about 4 hours.